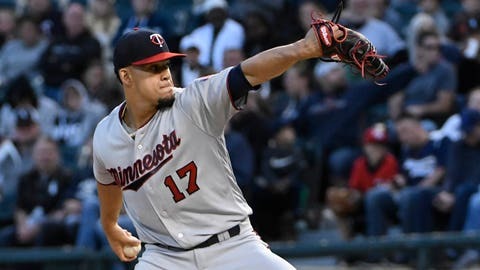 MINNEAPOLIS — After snapping out of a lengthy funk with a four-game sweep of the woeful Baltimore Orioles, the Minnesota Twins will try to take advantage of another struggling AL opponent when the Kansas City Royals come to Target Field Monday night for the opener of a three-game series. Minnesota had lost six in a row, eight of its last 10 and 11 of its last 13 before outscoring Baltimore 25-9 in the four-game sweep, which was just the Twins’ second sweep of the season and their first four-game sweep of an opponent since Sept. 21-24, 2017. Jose Berrios gets the start in the series opener. The right-hander turned in a strong performance in his last outing, holding the Brewers to three runs on five hits over seven innings but took the loss for a second consecutive outing. “He’s been able to respond (after losses) and come back the next outing and get back on track,” manager Paul Molitor said. Berrios is 0-1 with a 6.66 ERA in five career starts against the Royals, who are 0-7 so far this month and have dropped nine straight overall after falling to the Red Sox, 7-4, Sunday afternoon. Slumping shortstop Alcides Escobar was held out of that contest, marking the first time he’s missed a game since Sept. 25, 2015 when manager Ned Yost rested several starters against Cleveland a day after the Royals clinched the Al Central title. His streak of 421 consecutive games played was the longest active streak in the majors. Escobar has yet to get it going at the plate this season. He was batting just .194 with three home runs and 19 RBIs heading into Sunday’s game, so he understood why Yost held him out of the lineup. Yost said there was no particular reason that Sunday was the day for the streak to end. “I just decided today was it,” Yost said. “I don’t have a ‘scientifical’ equation where I went out and looked at 19 different factors and looked at how the stars lined up with the moon. Yost didn’t say whether or not Escobar will be back in the lineup Monday behind left-hander Danny Duffy (4-8, 5.19 ERA) who is 5-1 with a 2.43 ERA in 18 career outings (14 starts) against the Twins, including a 4-0 record and 2.06 ERA in eight appearances, including six starts, at Target Field.